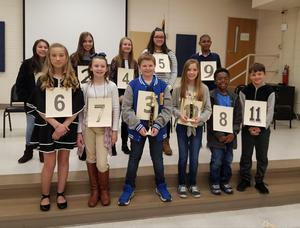 The District Spelling Bee was held at Palmetto Learning Center recently. The school Bee Winners had seven rounds of spelling before the champion emerged. The winner was Brayden Burr (Ruby Elementary) and the runner-up was Raegan Griggs (Plainview Elementary). All of the eleven students are allowed to compete in the Regional Spelling Bee in Florence on Monday, February 4th. The Regional winner advances to the National Spelling Bee in Washington, DC.